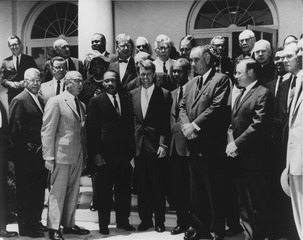 Photograph of White House meeting with Civil Rights Leaders including Dr. Martin Luther King, Jr. This year marks the 50th anniversary of the tragic assassination of one of the greatest leaders of modern times, Dr. Martin Luther King, Jr. If he would have lived until today, he would have turned 89 years old. It is hard to imagine in what ways the world would be different if he had indeed lived his life out until its full measure, but we know he did change the world even in the short years on earth that he was allotted. In honor of his memory the Brooklyn Academy of Music has been celebrating his birthday; and this year marks the 32nd such celebration. The largest public celebration in New York for Reverend King, the event included the inspiring voices of the Brooklyn Interdenominational Choir in addition to speeches by world famous activists, intellectuals and civic leaders. The keynote speaker was Jelani Cobb.